At the center of this infrared image is a massive red galaxy, 9.8 billion light-years from Earth, which acts like a cosmic magnifying glass, distorting the light from an even more distant galaxy, 17.3 billion light-years away. 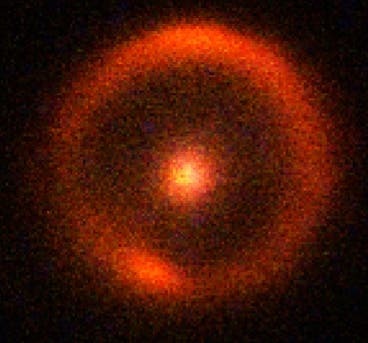 The result is a spectacular Einstein ring image of the background galaxy. The observations were made with the 10-meter Keck-11 Telescope on Mauna Kea, Hawaii. A faint “satellite galaxy” 10 billion light years from Earth is the lowest-mass object ever detected at such a distance, says University of California, Davis, physics professor Chris Fassnacht, who aided in the satellite’s discovery. The discovery, described in a paper published online today (Jan. 18) in the journal Nature, could help astronomers find similar objects and confirm or reject theories about the structure of the cosmos. Theory predicts that galaxies should be surrounded by halos of smaller, satellite blobs of mass, according to Fassnacht. Astronomers have detected such satellites around our own galaxy, the Milky Way, and nearby. But they had not previously detected the predicted satellites of more distant galaxies.Because most of the mass of galaxies is made up, not of stars, but of “dark matter,” which does not absorb or emit light, these distant objects may be very faint or even completely dark.The team looked for faint or dark satellites of distant galaxies using a method called gravitational lensing. Using the Keck II telescope at the W.M. Keck Observatory on Mauna Kea, Hawaii, with “adaptive optics,” they found two galaxies aligned with each other, as viewed from Earth. The nearer object’s gravitational field deflects the light from the more distant object as the light passes through or near the other object’s gravitational field, creating a distorted image as if passed through a lens. By analyzing these distorted images, the researchers could determine if there were any satellite galaxies clustered around the “lens” galaxy. Adaptive optics make constant, tiny adjustments to the telescope mirror to compensate for the effects of the Earth’s atmosphere. As a result, the Keck telescopes can achieve higher resolution than the Hubble Space Telescope. The technique can now be applied to many more galaxies, Fassnacht said. “As we collect more objects, we can do more precise tests of our simulations and make predictions about the structure of the universe,” he said. “Now we have one dark satellite, but suppose that we don’t find enough of them — then we will have to change the properties of dark matter. Or, we might find as many satellites as we see in the simulations, and that will tell us that dark matter has the properties we think it has,” said First author Simona Vegetti, a postdoctoral researcher at the Massachusetts Institute of Technology.